In so many endeavours practice is extremely important.... fortunately we had time yesterday evening to put in a last minute workout before heading to Jerez today. 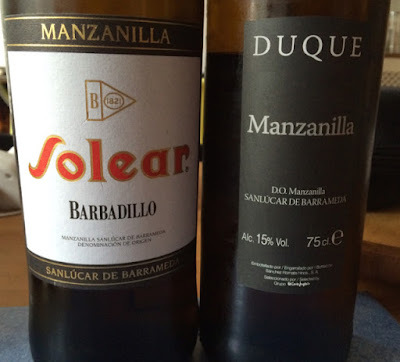 A visit to El Corte Inglés provided us with two Manzanillas to try – Solear by Barbadillo (€6.55) and Duque from Sanchez Romate for just €3.99. Both were characteristically clean and salty. The Solear did more depth and layers so merited the higher price. Duque, however, at €3.99 is remarkably good for the price and represents excellent value. Whether this is really profitable for Sanchez Romate and good for the image of wines from Jerez is quite another matter.